After our prior post on MassPlanner for Pinterest, we jumped into testing Mass Planner posting to Facebook Groups and are pleased to share our favorite features. This is NOT a tutorial article, but instead an overview to help you decide if Mass Planner is right for your business. Suppose you are just beginning to use Facebook for Internet Marketing. You’ve established a Profile and set up your Facebook Business Page. Next, you should join some groups that contain your targeted audience. Authenticity: Humans create groups. People make mistakes. Check if the group has postings from only one person. This is an indication that the user created a group when they really meant to promote a business page. Frequency: People begin a group and lose motivation. See when the last post was made and how many people post each day. Finding the right group can be more beneficial than joining ten groups that you didn’t research. Group Rules: Take notes on the rules. Some groups want no ads, but they would still permit blog posts. Choose the groups you wish to join and Mass Planner will automatically join them in a natural manner, staggering the requests. Next, you will create Destination Lists. These are targeted audiences that would be interested in your post whether it is a blog post, image, or advertisement. A list can consist of only 1 page, only 1 group, or a mixture of pages and groups. Note: When you connect your Facebook Pages within Mass Planner, you will want to connect them so that you are posting as your Business Page and not your Profile. This ensures that your post will show up on your Business Page wall and not the sidebar, where visitor posts appear. 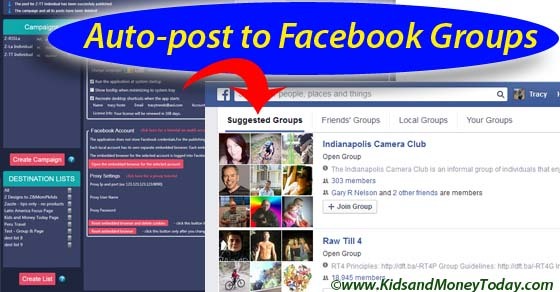 We suggest that you create your own private group on Facebook, along with a unique page for testing purposes. This way you can run campaigns to this “Test List” (consisting of your page and private group) to be sure you are happy with the posting before going live to post to public feeds. Stagger your posts: Meaning you will post to one group (or page) and then wait a little bit before posting to the next group (or page) within your chosen list. This will help you maintain a natural posting over to Facebook, prevent you from appearing spammy, and help you avoid any penalties, banning, or closed Facebook accounts. Choose Destinations: Allows you to set your post to go to every group in your list or a random number in the list. For example, if you have a list of 25 groups, you might send a unique post to five and then move on to the next unique post. This is particularly helpful if you have groups that have overlapping members. They probably don’t want to see your same post in every group. Even if you are staggering your posts in your campaign over to different Facebook groups at different hours of the day, you might want to make their appearances look a little different. You can use the Spin Syntax Signature feature to slightly alter your customized signature and give a natural appearance to your post. Aside from scheduling individual posts into a queue to auto-post to Facebook, you might also use an RSS Feed. The procedure is similar to the above concept. You choose a RSS Feed Volume campaign, choose your Destination List, and enter the feed URL. The only improvement we could immediately request is the ability to choose the day of the week and exact hour for campaigns. The developers are aware of this, so we might see this shortly.